Despite Baltimore’s many visitor offerings, its promotion as a travel destination has been challenged by crime reports and negative headlines. Since beginning our PR representation of Baltimore in 2008, Finn Partners (FP) has shifted the narrative toward the city’s renaissance, evidenced by a thriving culinary scene, new festivals and major hotel openings. To support this, FP maximized major events and openings happening in 2018 to secure top-tier media coverage. A winning result of this effort was Baltimore’s inclusion in the New York Times’ prestigious “52 Places to Go” list. Baltimore’s place alongside such destinations as New Orleans and Colombia cemented Charm City as an international destination worthy of more than just a trip to the National Aquarium while en route to DC. Baltimore was listed at #15, and subsequently profiled in “The 52 Places Traveler: A Celebration of African-American Culture in Baltimore” online and in print. The New York Times reaches a wide audience of readers in the NYC area and across the country (29,886,442 online and 597,955 in print). The varied makeup of this large audience aligns with our PR plan’s target demographics: •	Drive market travelers (NYC, DC, Philadelphia) •	Millennials •	Families •	Arts & culture travelers •	Culinary travelers •	Black travelers •	History travelers •	General population The New York Times “52 Places to Go” list is published annually, but this year, the newspaper hired and assigned a reporter to visit all 52 places on the list, writing features about her travels along the way. Because of this, Baltimore was not only included in the list, both print and online, but also profiled in a full-length print and online story, significantly furthering the reach of our renaissance and “why go to Baltimore in 2018” messaging. In August 2017, we sent a tightly crafted pitch to travel writer Nora Walsh, in response to her “Where to Go in 2018” lead for an unspecified outlet, knowing from our relationship with her that she contributes to The New York Times and that she was likely collecting ideas for the annual list at that time. Highlights included the celebration of the 200th anniversary of Frederick Douglass’s birth, the Hotel Revival opening and the third iteration of Light City (America’s first international, light and music innovation festival). After connecting with Nora and securing initial interest, we liaised with Visit Baltimore in order to gather additional “why go to Baltimore now” information from partners, events, etc. for Nora’s pitch to her New York Times editor. We conducted several rounds of fact-checking with Nora ahead of the “Where to Go in 2018” publication. 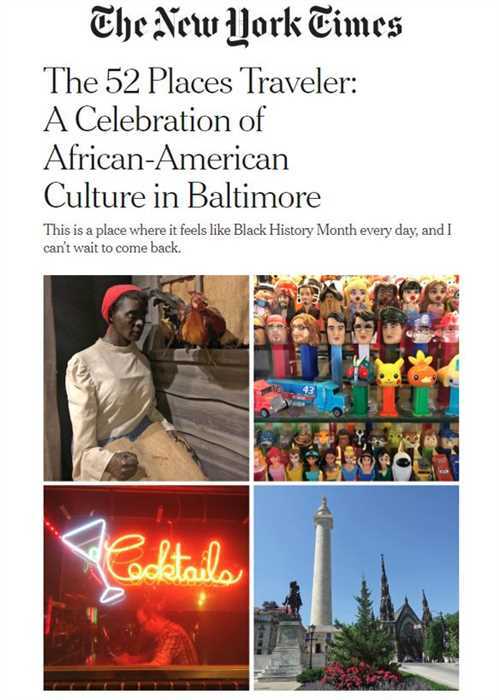 “A Celebration of African-American Culture” was one of the few 52 Places pieces to run in print, in addition to online. The story highlighted Baltimore’s many layers, its rich pride and history as a majority-black city, many of the city’s leading attractions and its greatest asset – its people. We achieved our goal to reach a wide audience with Baltimore’s renaissance messaging and to incorporate as many Visit Baltimore members as possible, including hotels: The Ivy, Sagamore Pendry, Hotel Revival; attractions: Fort McHenry, the Washington Monument, the National Great Blacks in Wax Museum, the “Path to Freedom” walking tour, American Visionary Art Museum, Inner Harbor, Light City festival; and restaurant partners like Land of Kush, Parts & Labor, and Faidley’s Seafood in Lexington Market. The reach of the stories was over 60,968,794, with an ad value of $5,638,614.